The guiding force behind the OSGi Specifications is a reusable component model. The OSGi Core Release 7 provides a solid foundation for such a component model by providing a component collaboration framework with a comprehensive management model. The service specifications provide the abstract APIs to allow many different collaborations between components. This Repository Service Specification provides the capability to manage the external access to components and other resources. Though the Repository service can be used as a standalone service to search and retrieve general binary artifacts, called resources, it is intended to be used in conjunction with the  Resolver Service Specification. 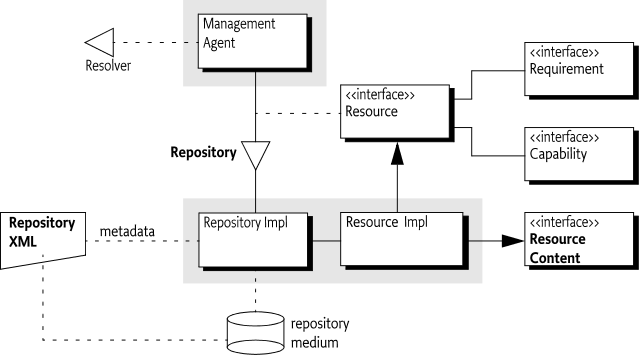 The model of the Repository is based on the generic Requirement-Capability model defined in  Resource API Specification, this chapter relies on the definitions of the generic model. External - Provide access to external components and resources. Resolve - The Repository API must be closely aligned with the Resolver API since they are intended to be used in conjunction. Searching - Support general queries. Metadata - Allow resources to provide content information. Retrieval - Allow the retrieval of Resources from remote locations. Batching - Repositories must be able to batch queries. Distribution - Allow Repositories to be defined with a simple storage scheme such that Repositories can be distributed on a removable media like a CD/DVD. Mirroring - Repositories must be able to support selecting a remote site based on the local situation. Repository - A facade to a (remote) set of resources described by capabilities. Resource - An artifact that has requirements that must be satisfied before it is available but provides capabilities when it becomes available. Requirement - An expression that asserts a capability. Capability - Describes a feature of the resource so that it can be required by a requirement. Resource Content - Provides access to the underlying bytes of the resource in the default format. There are many different repositories available on the Internet or on fixed media. A repository can be made available to bundles by providing a Repository service. If such a bundle, for example a Management Agent performing a provisioning operation, finds that it has an unmatched requirement then it can query the repository services to find matching capabilities. The Repository service can implement the query in many different ways. It can ship the requirement to a remote side to be processed or it can process the query locally. This specification also provides an XML schema that can be used to describe a Repository. Instances of this schema can be downloaded from a remote repository for local indexing or they can be stored for example on a DVD together with the resources. The Repository service provides an abstraction to a, potentially remote, set of resources. In the generic Capability-Requirement model, resources are modeled to declare capabilities and requirements. The primary purpose of a Repository is to enable a management agent that uses the Resolver API to leverage a wide array of repositories. This Repository service specification allows different Repository providers to be installed as bundles, and each bundle can register multiple Repository services. The Repository is sufficiently abstract to allow many different implementations. service.pid - A mandatory unique identity for this Repository service. service.description - An optional human readable name for this Repository. repository.url - Optional URLs to landing pages of the repository, if they exist. In general, the users of the Repository service should aggregate all services in the service registry. This strategy allows the deployer to control the available Repositories. The following example, using Declarative Service annotations to show the dependencies on the service registry, shows how to aggregate the different Repository services. To access a resource in a Repository service it is necessary to construct a requirement, pass this to the Repository service, and then use the returned capabilities to satisfy the resolver or to get the resource from the capability. The Repository then returns all matching capabilities. The requirement matches the capability if their namespaces match and the requirement's filter is absent or matches the attributes. Resources that originate from Repository services must implement the RepositoryContent interface, this interface provides stream access to the default storage format. It is therefore possible to get the content with the following code. osgi.content - A unique SHA-256 for the content as read from the URL. url - A URL to the content. mime - An IANA MIME type for the content. size - Size in bytes of the content. Since the osgi.content capability contains the SHA-256 digest as the osgi.content attribute it is possible to verify the download that it was correct. In some cases it may be useful to find resources in the repository that satisfy criteria across multiple namespaces. This requirement contains three conditions on the osgi.wiring.package capability. In some situations it may be needed to specify requirements that cover multiple namespaces. For example a bundle might be needed that exports the above package, but the bundle must also have the Apache License, Version 2.0 license. A resource's license is available as an attribute on the osgi.identity namespace. Constructing a constraint that combines requirements from multiple namespaces can be done by using an Expression Combiner, which can be obtained from the Repository service. The Repository service provides a findProviders(RequirementExpression) overload that can take a requirement expression and returns a Promise to a collection of matching resources. For more details on OSGi Promises, see the Promises Specification. A Repository service provides access to capabilities that satisfy a given requirement. A Repository can be the facade of a remote server containing a large amount of resources, a repository on removable media, or even a collection of bundles inside a ZIP file. A Repository communicates in terms of requirements and capabilities as defined in  Resource API Specification. This model is closely aligned with the  Resolver Service Specification. A Repository service must be registered with the service properties given in the following table. A globally unique identifier for this Repository. URLs related to this Repository. findProviders(Collection) - For each requirement find all the capabilities that match that requirement and return them as a Map<Requirement,Collection<Capability>>. findProviders(RequirementExpression) - Find all resources that match the requirement expression. The requirement expression is used to combine multiple requirements using the and, or and not operators. getExpressionCombiner() - Obtain an expression combiner. This expression combiner is used to produce requirement expressions from simple requirements or other requirement expressions. newRequirementBuilder(String) - Obtain a convenience builder for Requirement objects. The requirement's filter is absent or it must match the capability's attributes. Implement the RepositoryContent interfaces, see Repository Content. Provide at least one osgi.content Capability, see osgi.content Namespace. Resources originating from a Repository must implement the RepositoryContent interface. The purpose of this interface is to allow users of the Repositories access to an Input Stream that provides access to the resource. getContent() - Return an Input Stream for the resource, if more than one osgi.content capability is present the content associated with the first capability is returned. A resource is a logical concept, to install a resource in an environment it is necessary to get access to its contents. A resource can be formatted in different ways. It is possible to deliver a bundle as a JAR file, a Pack200 file, or some other format. In general, the RepositoryContent interface provides access to the default format. The Repository can advertise the different formats with osgi.content capabilities. Each of those capabilities is identified with a unique SHA-256 checksum and has a URL for the resource in the specified format. The size and mime attributes provide information the download format, this can be used for selection. If more than one osgi.content capability is associated with a resource, the first capability must represent the default format. If the resource has a standard or widely used format (e.g., JAR for bundles and ESA for subsystems), and that format is provided as part of the repository, then that format should be the default format. The osgi.content Namespace supports the attributes defined in the following table and ContentNamespace. The URL to the bytes. This must be an absolute URL. The size of the resource in bytes as it will be read from the URL. An IANA defined MIME type for the format of this content. This is an optional part of the specification since the Repository interface does not provide access how the Repository obtains its information. However, the purpose of this part of the specification is to provide a commonly recognized format for interchanging Repository metadata. 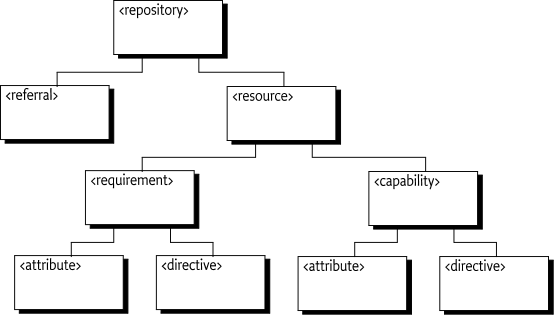 This section therefore describes an XML schema to represent Repository content. It is expected that Internet based Repositories can provide such an XML file to clients. A Repository XML file can be used as a common interchange format between multiple Repository implementations. The Repository XML describes a number of resources with their capabilities and requirements. Additionally the XML can refer to other Repository XML files. The XML Schema can be found at its XML namespace, see XML Repository Schema. The XML structure, which closely follows the Requirement-Capability model, is depicted in Figure 132.2. The different elements are discussed in the following sections. All types are derived from the XML Schema types, see  XML Schema Part 2: Data types Second Edition. Any relative URIs in a Repository XML file must be resolved as specified in  XML Base (Second Edition), Resolving Relative URIs. referral* - Referrals to other repositories for a federated model, see Referral Element. resource* - Resource definitions, see Resource Element. The repository element has the attributes defined in the following table. The name of this Repository. For informational purposes. Counter which increments every time the repository is changed. Can be used by clients to check for changes. The counter is not required to increase monotonically. The purpose of the referral element is to allow a Repository to refer to other Repositories, allowing for federated Repositories. Referrals are applied recursively. However, this is not always desired. It is therefore possible to limit the depth of referrals. If the depth attribute is >= 1, the referred repository must be included but it must not follow any referrals from the referred repository. If the depth attribute is more than one, referrals must be included up to the given depth. Depths of referred repositories must also be obeyed, where referred repositories may reduce the effective depth but not increase it. For example if a top repository specifies a depth of 5 and a level 3 repository has a depth of 1 then the repository on level 5 must not be used. If not specified then there is no limit to the depth. Referrals that have cycles must be ignored, a resource of a given Repository must only occur once in a Repository. The referral element has the attributes defined in the following table. A URL to where the referred repository XML can be found. The URL can be absolute or relative to the URI of the current XML resource. requirement* - The requirements of this resource, see Requirement Element. capability* - The capabilities of this resource, see Capability Element. The Resource element has no attributes. directive* - The directives for the capability, see Directive Element. attribute* - The attributes for the capability, see Attribute Element. The capability element has the attributes defined in the following table. directive* - The directives for the requirement, see Directive Element. attribute* - The attributes for the requirement, see Attribute Element. The requirement element has the attributes defined in the following table. An attribute element describes an attribute of a capability or requirement. Attributes are used to convey information about the Capability-Requirement. Attributes for the capability are used for matching the requirement's filter. The meaning of attributes is described with the documentation of the namespace in which they reside. A list conversion requires the value to be broken in tokens separated by comma (',' \u002C). Whitespace around the list and around commas must be trimmed for non-String types. Each token must then be converted to the given type according to the scalar type specifier. The exact rules for the comma separated lists are defined in  Framework Module Layer, see Bundle Capability Attributes. The attribute element has the attributes defined in the following table. The type of the attribute, the syntax is outlined in the previous paragraphs. A directive element describes a directive of a capability or a requirement. Directives are used to convey information about the Capability-Requirement. The meaning of directives is described with the documentation of the namespace in which they reside. The directive element has the attributes defined in the following table. The following example shows a very small XML file. The file contains one resource. The schema for this namespace can be found at the location implied in its name. The recommended prefix for this namespace is repo. repository has been updated by checking this increment value. The depth of referrals this repository acknowledges. used to resolve a requirement if the resource is included. same name space must be able to match this capability. A filter on a named set of capability attributes. same name space must be able to match this requirement. how to process a requirement or capability. The value of the directive. Implementations of the Repository Service specification must provide the capabilities listed in this section. If the malevolent Bundle could change the osgi.content attribute it could change it to arbitrary URLs. This example should make it clear that Repository implementations must be very careful. Implementations of this specification will need the following minimum permissions. Users of this specification will need the following minimum permissions. AndExpression - A RequirementExpression representing the and of a number of requirement expressions. ContentNamespace - Content Capability and Requirement Namespace. ExpressionCombiner - An ExpressionCombiner can be used to combine requirement expressions into a single complex requirement expression using the and, or and not operators. IdentityExpression - A RequirementExpression representing a requirement. NotExpression - A RequirementExpression representing the not (negation) of a requirement expression. OrExpression - A RequirementExpression representing the or of a number of requirement expressions. Repository - A repository service that contains resources. RepositoryContent - An accessor for the content of a resource. RequirementBuilder - A builder for requirements. RequirementExpression - The super interface for all requirement expressions. □ Return the requirement expressions that are combined by this AndExpression. Returns An unmodifiable list of requirement expressions that are combined by this AndExpression. The list contains the requirement expressions in the order they were specified when this requirement expression was created. 132.9.3.1 public static final String CAPABILITY_MIME_ATTRIBUTE = "mime"
132.9.3.2 public static final String CAPABILITY_SIZE_ATTRIBUTE = "size"
132.9.3.3 public static final String CAPABILITY_URL_ATTRIBUTE = "url"
132.9.3.4 public static final String CONTENT_NAMESPACE = "osgi.content"
expr1 The first requirement expression to combine into the returned requirement expression. □ Combine two RequirementExpressions into a requirement expression using the and operator. Returns An AndExpression representing an and of the specified requirement expressions. moreExprs Optional, additional requirement expressions to combine into the returned requirement expression. □ Combine multiple RequirementExpressions into a requirement expression using the and operator. req The requirement to wrap in a requirement expression. □ Wrap a Requirement in an IdentityExpression. This can be useful when working with a combination of Requirements and RequirementExpresions. Returns An IdentityExpression representing the specified requirement. expr The requirement expression to negate. □ Return the negation of a RequirementExpression. Returns A NotExpression representing the not of the specified requirement expression. □ Combine two RequirementExpressions into a requirement expression using the or operator. Returns An OrExpression representing an or of the specified requirement expressions. □ Combine multiple RequirementExpressions into a requirement expression using the or operator. □ Return the Requirement contained in this IdentityExpression. Returns The requirement contained in this IdentityExpression. □ Return the requirement expression that is negated by this NotExpression. Returns The requirement expression that is negated by this NotExpression. □ Return the requirement expressions that are combined by this OrExpression. Returns An unmodifiable list of requirement expressions that are combined by this OrExpression. The list contains the requirement expressions in the order they were specified when this requirement expression was created. 132.9.8.1 public static final String URL = "repository.url"
requirements The requirements for which matching capabilities should be returned. Must not be null. □ Find the capabilities that match the specified requirements. Returns A map of matching capabilities for the specified requirements. Each specified requirement must appear as a key in the map. If there are no matching capabilities for a specified requirement, then the value in the map for the specified requirement must be an empty collection. The returned map is the property of the caller and can be modified by the caller. The returned map may be lazily populated, so calling size() may result in a long running operation. expression The RequirementExpression for which matching capabilities should be returned. Must not be null. □ Find the resources that match the specified requirement expression. Returns A promise to a collection of matching Resources. If there are no matching resources, an empty collection is returned. The returned collection is the property of the caller and can be modified by the caller. The returned collection may be lazily populated, so calling size() may result in a long running operation. □ Return an expression combiner. An expression combiner can be used to combine multiple requirement expressions into more complex requirement expressions using and, or and not operators. namespace The namespace for the requirement to be created. □ Return a new RequirementBuilder which provides a convenient way to create a requirement. Returns A new requirement builder for a requirement in the specified namespace. □ Returns a new input stream to the content of this resource. The content is represented on the resource through the osgi.content capability. If more than one such capability is associated with the resource, the first such capability is returned. Returns A new input stream for associated content. □ Add an attribute to the set of attributes. □ Add a directive to the set of directives. □ Create a requirement based upon the values set in this requirement builder. Returns A requirement created based upon the values set in this requirement builder. □ Create a requirement expression for a requirement based upon the values set in this requirement builder. Returns A requirement expression created for a requirement based upon the values set in this requirement builder. attributes The map of attributes. □ Replace all attributes with the attributes in the specified map. directives The map of directives. □ Replace all directives with the directives in the specified map. The super interface for all requirement expressions. All requirement expressions must extend this interface. Clarified that any relative URIs in a Repository XML file must be resolved as specified in  XML Base (Second Edition), Resolving Relative URIs.